Kathryn Karam became a board certified specialist in Immigration and Nationality Law in 2012. This important designation was awarded by the Texas Board of Legal Specialization (TBLS). The TBLS was established in 1974 by the Texas Supreme Court at the request of the State Bar of Texas. The TBLS is the only governing board authorized to certify attorneys in legal specialty areas such as immigration law. The Board Certification program is administered by a twelve-member board appointed by the President of the State Bar of Texas. The Supreme Court of Texas provides oversight and exercises jurisdiction over all matters pertaining to specialization in the practice of law within Texas. Out of more more than 70,000 attorneys licensed to practice law in Texas, only 7,000 have earned the right be be recognized as a board-certified specialist by the TBLS in one of 21 select areas of the law. The specialty area of Immigration and Nationality Law was started in 1979. Not all attorneys practicing immigration law have earned this special designation so it is important to learn more about this prestigious designation. 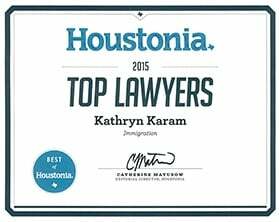 If you are looking for an attorney who has earned the designation as a board certified specialist in immigration and nationality law in Houston, Harris County, TX, then call Kathryn Karam at [$phone]] to discuss your case. Immigration and Nationality is generally defined as securing visas or other documentation to enter or remain in the United States, asylum, citizenship and nationalization. It is the practice of law dealing with the Immigration and Nationality Act of 1952, as amended, and all successor and other laws and regulations dealing with immigration and naturalization. removal proceedings and related applications for relief. The TBA created specific requirements that apply to specialty certification in immigration and nationality law. The standards for becoming certified in this area were last revised on February 8, 2011. Those requirements include the general requirements that apply to all specialty areas and specific task requirements and substantial involvement requirements that apply to certification in immigration law. The general requirements include practicing for a minimum of five years with the last three years involving substantial involvement in the specified area of law; completing the TBLS-approved Continuing Legal Education course requirements, furnishing at least 10 qualified, vetted references, providing extensive, relevant experience documentation and passing a comprehensive, daylong, specialty area examination. To apply to become a certified specialist in immigration law with the TBLS, the applicant show substantial involvement and special competence in immigration and nationality law practice by providing such information as may be required by TBLS. The attorney must devote a a minimum of 25% of the practice to immigration and nationality law during each year of the 3 years immediately preceding application. Applicant must exhibit substantial involvement and special competence in each of the following immigration and nationality law matters participated in within the 3 years immediately preceding application. Administrative Hearings - Representation of clients in at least 9 contested hearings before immigration judges involving removal or bond determination. No more than 3 of the 9 hearings may have involved only bond matters. Petitions and Applications - Representation of clients before the U.S. Department of Homeland Security and/or the U.S. Department of State in the preparation and filing of petitions and applications. Citizenship/Naturalization - Representation of clients before the U.S. Department of Homeland Security, U.S. Department of State, and/or judicial courts in citizenship, naturalization, and/or renunciation or revocation matters. In addition to meeting Section VII, B, 1, b, (1), (a-c) above, applicant must meet two of the following categories within the 3 years immediately preceding application. Alien Labor Certifications - Representation of employers and/or aliens before the various state employment services, U.S. Department of Labor, and U.S. Department of Homeland Security in preparation and filing of alien labor certification cases. Administrative Appeals and Advisory Opinions - Representation of clients in appeals and/or proceedings before the Board of Immigration Appeals, Administrative Appeals Office, Board of Alien Labor Certification Appeals, the U.S. Department of State Advisory Opinions office, or other administrative appellate entities with competent jurisdiction over matters related to immigration and nationality law. Review in Judicial Courts. Representation of clients in judicial matters relating to immigration and nationality law such as applications for writs of habeas corpus, mandamus, declaratory judgments, criminal matters involving the immigration law, petitions for review in judicial courts, and ancillary proceedings in judicial courts. Employer Sanctions - Representation of clients in administrative proceedings relating to employer sanction, employment discrimination, and/or document fraud matters under the Immigration Nationality Act. Deferred Inspections, Expedited Removal, Humanitarian Parole, Documentary Waiver Requests, Deferred Action Requests, Private Bills, I-9 and LCA related Audits and Proceedings, Immigration Related Database Corrections, or other administrative proceedings not listed relating to immigration and nationality matters before governmental agencies of competent jurisdiction. Representation of clients in these types of matters. TBLS Directory of Board Certified Attorneys - Since 1974, the Texas Board of Legal Specialization (TBLS) certifies attorneys within select areas of law. The TBLS website maintains a directory of board certified attorneys. Directory of Board Certified Immigration Lawyers in Texas - Visit Lawyer Legion to find a national directory that helps you find a board certified attorney in any state sponsored or national specialty certification program. Use the directory to narrow your search to find an attorney who is a board certified specialist in Immigration Law in Texas. Immigration Law Attorneys in Houston, Texas - The Lawyer Legion directory also allows you to search for immigration attorneys in Houston, Texas. These attorneys are recognized for their membership and leadership in specialty certification programs and specialty bar associations focused on immigration law. If you are looking for a board certified specialist in immigration law in Houston, Texas, then contact Attorney Kathryn Karam. Board certification recognizes an attorney's proficiency, skills and additional training in a variety of unique practice areas including immigration law. Certified specialist in immigration law have be evaluated for their professionalism and ethics in their specialized practice. Kathryn Karam is extremely proud of this accomplishment. Call to discuss your case and find out more about how Ms. Karam can put her experience to work for you. By focusing on immigration law, Kathryn Karam can stay current on recent changes in the law that might impact your case. Call (832) 582-0620 today to discuss your case.